A few weeks ago, we called for artwork made with your favorite stamp sets, and you answered the call! We were surprised to see that so many of you selected the exact same stamp set as your favorite: My Acrylix® Sing Glory—a Hostess Rewards set! In celebration of this timely trend, today we’re featuring three different cards made with this same set, but done by three different artists. A huge thanks to our readers for sharing their talents with us! Our first card was made by Amie Kiger. The Sing Glory stamp set is Amie’s favorite Christmas stamp from Annual Inspirations, so she made sure to grab it first while planning her Christmas workshops. Amie found her inspiration on page seven of Annual Inspirations, then gave the card her own personal touch. First she pulled out a retired B&T paper from the Pear & Partridge kit and combined it with the sheet music B&T from the current Yuletide Carol kit. The musical notes of the paper fit the trumpeting angel and sentiment perfectly, don’t you think? We love the subtle imagery! 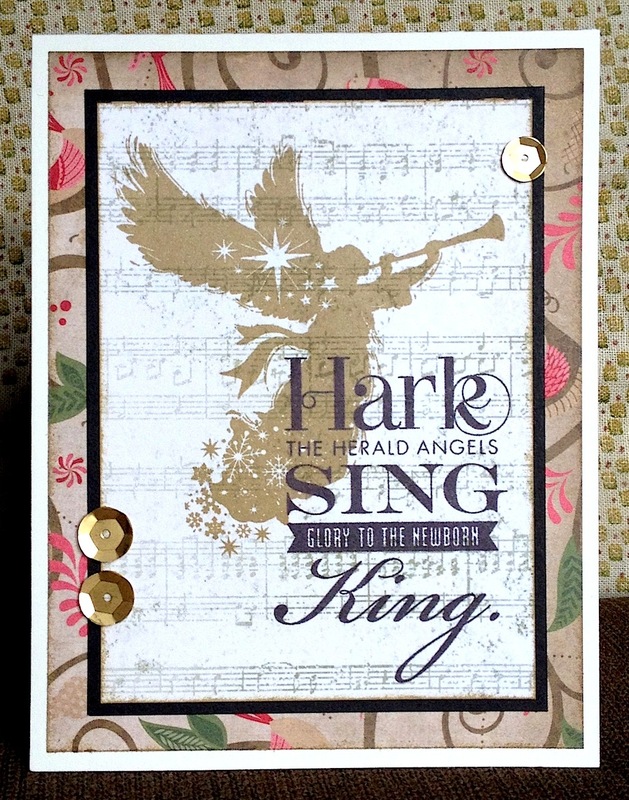 Amie used Desert Sand ink to stamp the angel image and black ink to stamp the “Hark, the Herald Angels Sing” sentiment, with a slight overlap of corners. Her choice of embellishment, the sequins gold assortment, gives the card some sparkle and follows the card’s glittering theme. Our second card was handcrafted by Nicole Robinson. Nicole started with the Yuletide Carol paper packet, which you can see for yourself on page 61 of Annual Inspirations. Her layering of cardstock and B&T brings the eye to a focal point: the embossed angel stamped image on its own piece of Colonial White cardstock! 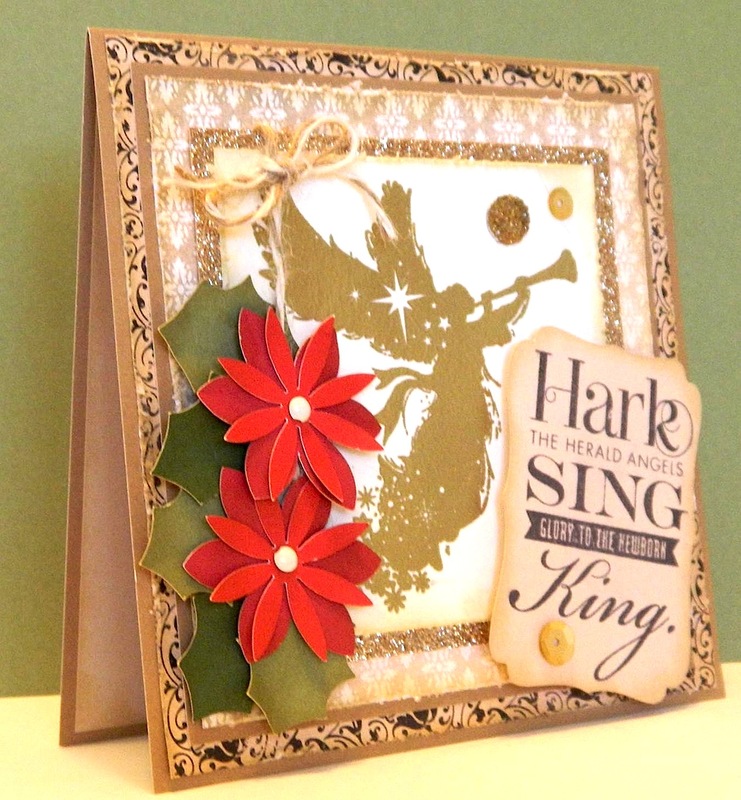 Nicole chose to stamp the “Hark, the Herald Angels Sing” sentiment in black ink on a Cricut®-cut shape, ink the edges, and attach it at an angle. The red floral accents Nicole crafted are a fun spin on the holly leaf sentiments of the stamp set, though they are not actual stamps from the set. What a clever idea! Our third card was submitted by Kara Davies. 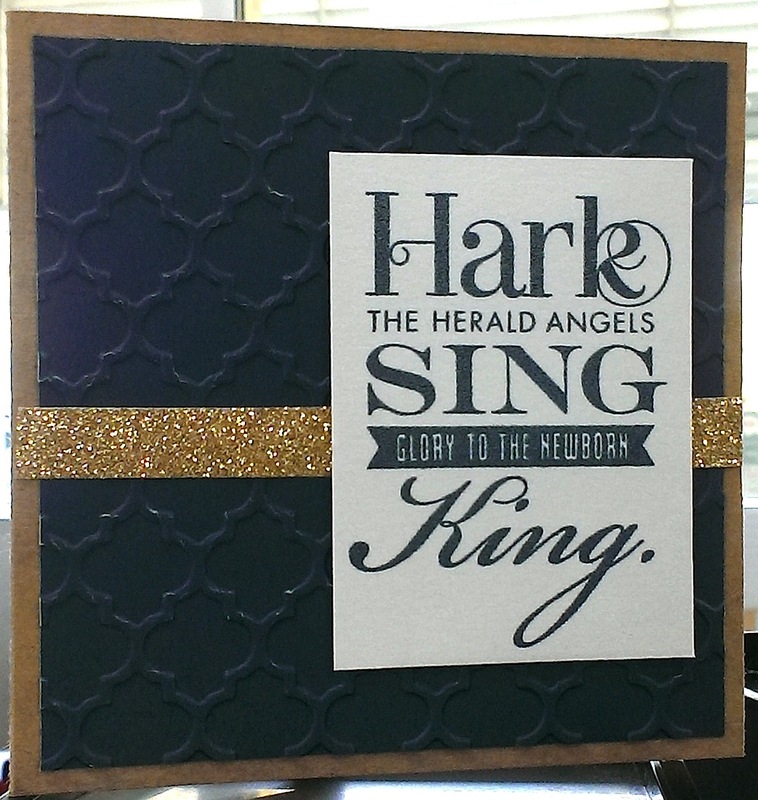 Her take on the stamp set is crisp and clean, and it uses just the “Hark, the Herald Angels Sing” sentiment as a focal point, without an additional stamp in the background. Kara stamped her sentiment in Outdoor Denim ink, which coordinates with the quatrefoil embossed Outdoor Denim cardstock in the background. A single piece of gold Shimmer Trim across the middle adds a pop of sparkle and dimension. Three spins on one very glorious stamp set. We love the versatility of our My Acrylix® stamps, and we hope you do too!